Ok so I haven’t been posting every day for the first week or so of 31 days. What’s that meme? Sorry I’ve been being a bad friend, I’ve been busy being an amazing mom? Maybe not amazing, but my kids are alive. That’s the end goal right? This week I’ve been doing a lot of cleaning and organizing. One of my projects is turning my daughters room into a homeschool friendly room. After much consideration on how to keep her room hers while also making it a fun place to learn it dawned on me: Minnie Mouse. She is the key to all things toddler – or at least all things Essie. 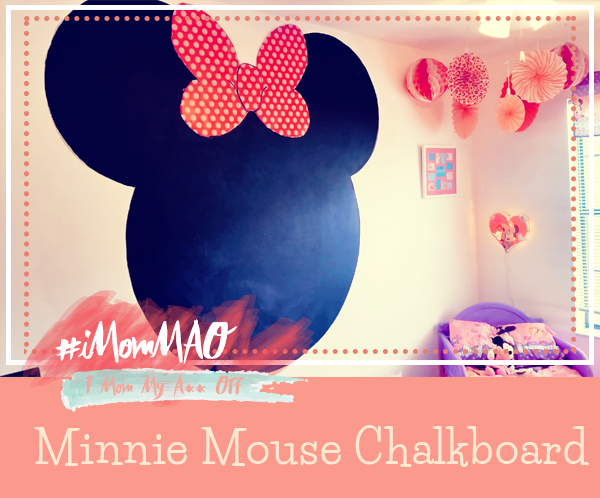 What better way to start a Minnie Mouse school room than a Minnie Mouse chalkboard? I can’t think of any. I so wish I would have done a step by step with this… shoulda woulda coulda right? Next postHow to: Get Pee out of Furniture, Carpet, Bed, Sofa, Etc.